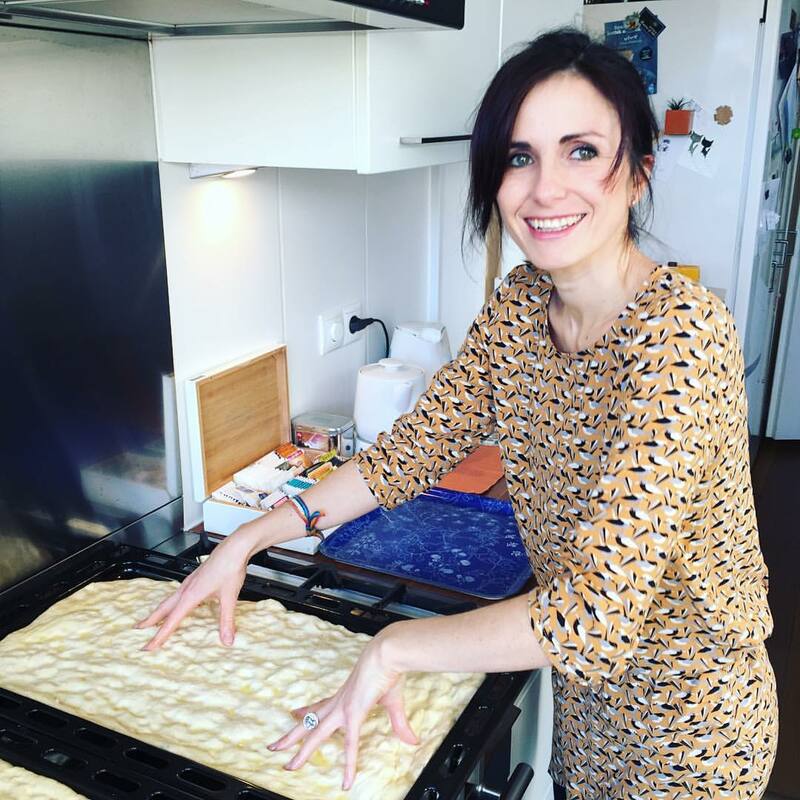 This week As Soup As Possible takes you on a trip to Bra, Northern Italy, to discover Piedmont’s cuisine. The Piedmont region is one of the greenest in the country and the second largest after Sicily. Its majestic landscapes hold treasures of taste for foodies and wine lovers. To give you an idea, if we can enjoy delicacies like grissini (breadsticks), Barolo, Moscato, gianduja and many more, we owe it to this voluptuous region of Italy. 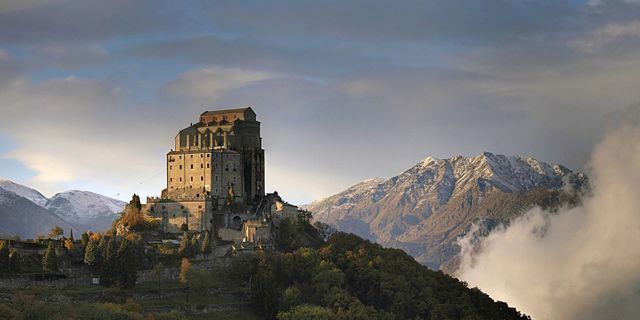 Sacra di San Michele, one of Piedmont’s most suggestive landmarks. This monumental abbey has inspired the Piedmont-born writer Umberto Eco to write his masterpiece The Name of The Rose. Photo credits: Elio Pallard, Creative Commons 4.0. It’s not a case if Slow Food International was born here, in the land of white truffle (the one from the Piedmontese city of Alba is the most precious and expensive in the world), marron glacés and many least famous yet equally fascinating specialties. Started by Carlo Petrini exactly 30 years ago in Bra, the movement stayed true to its mission “to defend regional traditions, good food, gastronomic pleasure and a slow pace of life” and grew to become a worldwide cultural phenomenon. Its motto of “good, clean and fair” food spread out to over 160 countries and is embodied in projects such as the Ark of Taste and Slow Food Presidia. These latter are aimed at preserving heritage foods and support small producers of traditional crops all over the world. Photo credits: Agenzia di Pollenzo, Bra. In the Piedmontese countryside, near Bra, Slow Food promoted the transformation of a former royal residence into a symbol of its philosophy and a renown gastronomic campus. This Neo-Gothic country estate once belonging to Carlo Alberto of Savoy, Pollenzo, is listed in the UNESCO World Heritage since 1997 and currently hosts the University of Gastronomic Sciences (UNISG) – founded by Slow Food in 2004, the Wine Bank, and a four-star hotel, Albergo dell’Agenzia, the restaurant of which serves some of the most traditional dishes in Piedmont’s cuisine. We sneaked into the kitchen to ask the chef what it’s like. I won’t lie to my fellow vegetarians: with its meat galore, Piedmont is not the easiest of the twenty Italian regions for us to eat out. On the bright side, I challenge you to find dull tastes in this corner of Italy: even with limited options I can assure you won’t be disappointed with your gastronomic journey. The chef with a happy customer. Piedmont is the fifth region in Italy by number of local products (after Tuscany, Campania, Lazio and Emilia-Romagna). Its culinary heritage is a very rich one and has its roots in rural culture, the legacy of which is visible in the variety of mountain cheeses, in the preference for butter over olive oil and in the way elaborate and sensuous recipes were developed to avoid food waste. Even as a long-term vegetarian, I can’t help but appreciate Piedmont’s cuisine for its use of the whole slaughtered animal, including the odd bits, the so-called quinto quarto (fifth forth). It’s a frugal and more sustainable approach to meat consumption that is hardly found in industrialised countries. To help you navigate the interview with chef Pierpaolo Livorno, here is a short glossary of Piedmontese specialties. 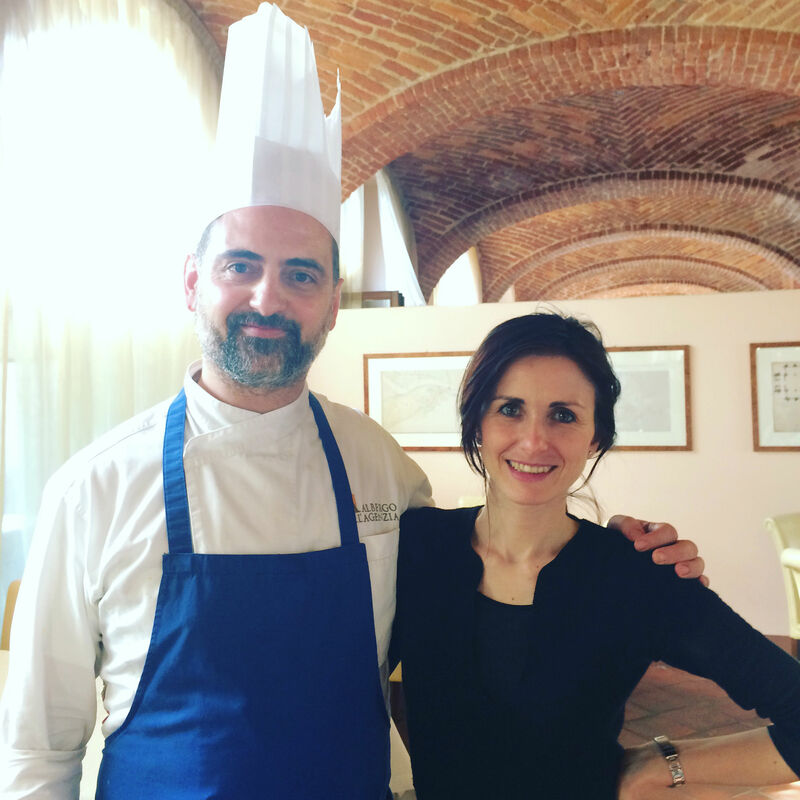 Piedmont’s cuisine – a culinary glossary. AGNOLOTTI – squared fresh pasta filled with roasted meats. They used to be a typical Sunday dish, made with a mix of meat leftovers from the week and freshly roasted meat. The fact that the filling is roasted before grinding is their distinctive character. When made with a vegetable filling (typically mixed with ricotta), they go by the name of ravioli. AGNOLOTTI DEL PLIN – a variation of agnolotti in the shape of tiny parcels. Their typical shape is obtained by sealing the pasta dough with a pinch (plin!). Their version with borragine (borage) filling is something else! The same naming rule applies: when the filling is vegetable-based, the name changes into “ravioli” del plin. ANIMELLE – if you are familiar with offal, these are nothing but sweetbreads – or thymus, if you prefer the anatomical term. They are used in several recipes. 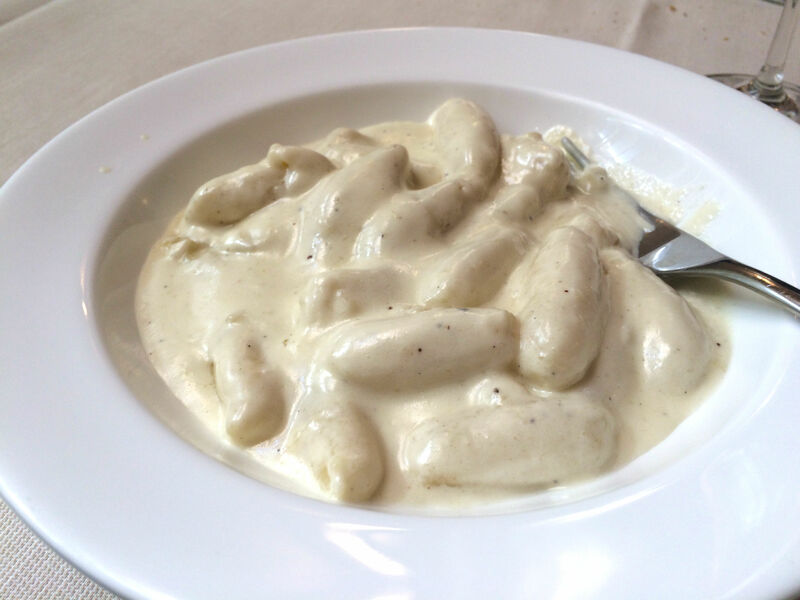 FINANZIERA – one of the most typical Piedmontese recipes, it dates back to the Middle Ages. Its fist record is in a cookbook from 1450. Finanziera is based on odd bits and includes porcini mushrooms, peas and marsala. FRITTO MISTO ALLA PIEMONTESE – typically a winter recipe, also based on a “nose to tail” approach. Fritto misto can be considered a full meal. It consists of breaded, then deep-fried pieces – of meat, odd cuts, offal, veggies and sweet semolina – served throughout the meal. GIARDINIERA (ANTIPASTO PIEMONTESE) – a pickled vegetable antipasto (starter). It was originally prepared as preserves, to store summer vegetables throughout rigid Piedmontese winters. TAGLIOLINI – long flat fresh egg pasta. The significant amount of egg in the recipe gives them a rich flavour. Tagliolini are 2-3 millimetre wide (wider than capellini, narrower than tagliatelle) and are commonly called tajerin in Piedmont. Next PostCarciofo Alla Giudia: When In Rome, Eat Artichokes!